What’s up with all this Scotch in space news? In the last few weeks, there’s been a lot of news involving scotch and space, the final frontier. Some of it was fluffy, some of it was legit, but it’s interesting how these stories clustered together. The two that I found were more on the legit end were Ardbeg’s results from sending new make into space and Ballantine’s Space Glass. We had Ardbeg reporting back on a space experiment they started four years ago. 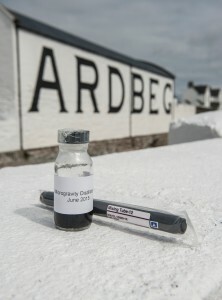 They sent some Ardbeg distillate (new make whisky) along with shards of Ardbeg casks to the International Space Station. Those vials stayed on the ISS for nearly three years and then sent back home. The study was to analyze terpenes, which are organic compounds produced by plants like conifers. Those vials made the trip back home and were compared with control vials left on Earth. Ardbeg’s Director of Distilling and Whisky Creation, Dr. Bill Lumsden, analyzed the results and discovered that the maturation was different when not subjected to gravity. Different flavors (ratios of wood extractive compounds from the barrel shards) just because it was in space. It means there are more levers to pull in making more distinctive single malts and kind of fun to see it play out. There’s a lot more to it, they performed three tests – gas chromatography (GC), gas chromatography-mass spectrometry (GCMS), and high pressure liquid chromatography (HPLC). GC measures key volatile compounds of alcohols, aldehydes, ketones, and fatty acid esters. For this, they found the same compounds in both the Earth and the Space samples. The GCMS is a more serious version of GC and they discovered that one phenolic compound was much lower in the space samples. And HPLC measures phenolic compounds and wood extractives, where they saw the biggest difference. With wood extractives, there are some compounds that come out of the wood easily and some that are harder. They discovered that without gravity, the easier to extract compounds were less prevalent than in the Earth sample. Gravity was a factor. Space whisky just didn’t get as much of the easy to get wood extractives. 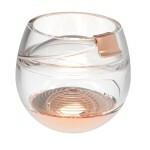 Ballantine designed a glass that will let you enjoy your whisky in space. At first glance, it sounds soooooo gimmicky. I mean a space glass? Really? But as you read about it, it’s kind of cool. No doubt it’s gimmicky in the sense that you’re not going into space so you’re not going to need a space glass. But… it’s also a really fun story because they didn’t just slap “Space Glass” on a regular glass, like Frozen’s been slapped on everything. (OK a Frozen glass with Elsa would be truly gimmicky). It’s a James Parr designed 3D printed plastic with a metal base that contains a one-way valve and a 10kg pull magnet. I’d go into all the different parts of the design but I’d rather you take five minutes to watch this video from the designer himself. This entry was posted in General and tagged Ardbeg, Ballantines by Jim. Bookmark the permalink. just a little note about what kind of scotch would be a good start to try when I really don’t drink much scotch , but willing to try again mostly burbon and irish whiskey. 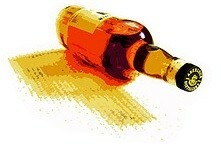 Interesting how the whisky was affected or not affected by gravity and the lack thereof. I am sure the taste is affected as well, but seems like it would be rather cost prohibitive to age your whisky in space. Maybe in the future?